Rich, damp chocolate cake with smooth and creamy caramel like pecan and coconut frosting. Pre-heat range to 350º F. Grease three 8-inch or two 9-inch round dessert pans with cooking squirt and softly dust with flour. I enjoy do 3 8x8 pans, and simply make a 2 level, dessert but set aside another cake for kids that don’t like German chocolate frosting and for my sisters that have fan allergies. This is certainly also great in a 9x13. In blending bowl (I prefer my cooking area help), add flour, sugar, cocoa, cooking dust, baking soda, and salt. Stir until well combined. Include milk, veggie oil, eggs, and vanilla to flour blend and combine collectively on moderate speed until well mixed. Lessen the speed to lower and include boiling-water toward cake batter a bit at the same time. When the water is all combined in, beat on large for around 1 moment. Uniformly distribute dessert batter amongst the three 8x8 pans (or two 9x9) prepared dessert pans. Bake for 30-35 mins, or until a toothpick or cake tester placed when you look at the center happens clean. Pull from oven and allow to cool off for around ten full minutes. Eliminate from the cooking pan and cool completely. *Note if you are layering the dessert, I always twice as much meal above and also have slightly additional frosting for later. If you're doing a 9x13 an individual recipe must be adequate. In a sizable saucepan combine evaporated milk and cornstarch and blend; include sugar, egg yolks, margarine and vanilla. Cook over low-medium heat until it hits a slow boil. Stirring continuously until thick, about 12 moments from when it starts to gradually boil. 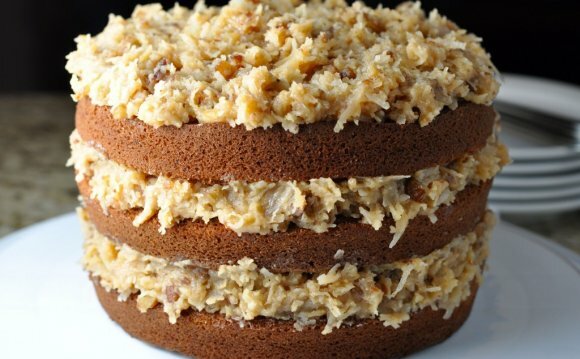 Remove from heat and blend in pecans and coconut, this frosting will thicken up as it cools. Allow cool 1 hour after that spread on cooled dessert. To create this cake very easy to slice, layer cake with frosting, after that emerge the refrigerator for half an hour or maybe more, after that slice and serve.